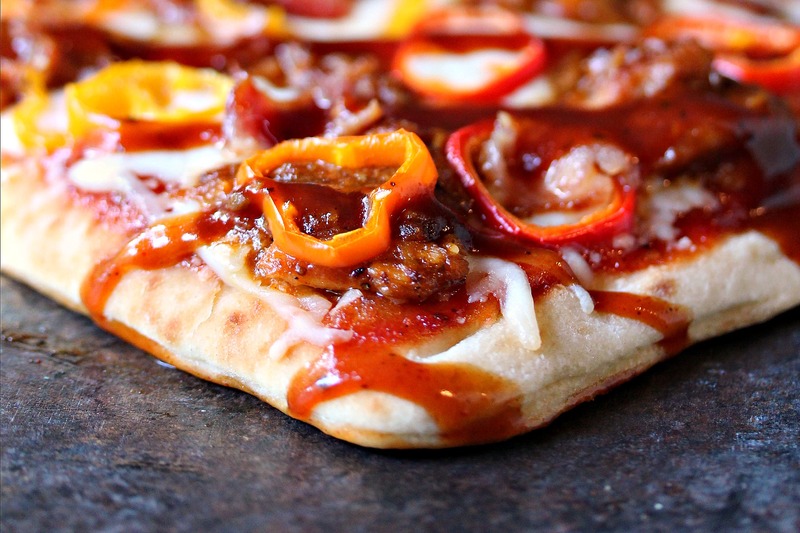 This flatbread pizza is topped with pulled BBQ chicken, sliced peppers, and pieces of bacon, then grilled to perfection. Once it comes off the grill drizzle it with more BBQ sauce and dive in! 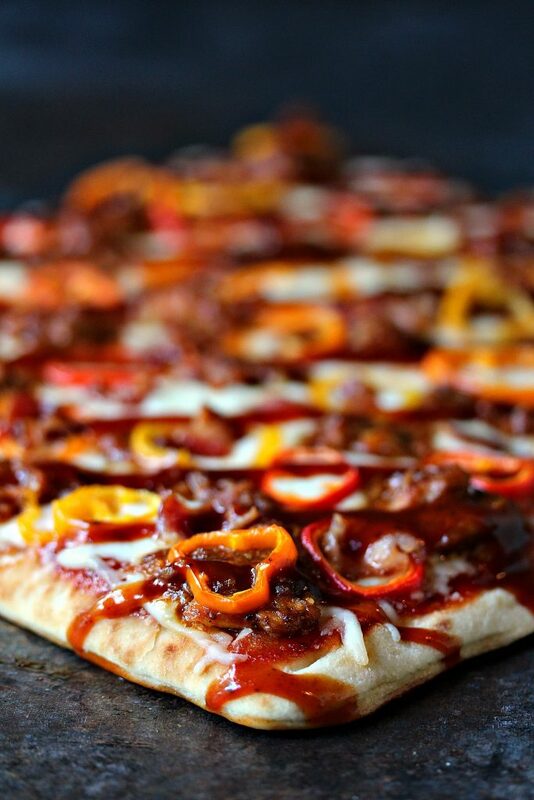 Click here to PIN this Grilled Flatbread Pizza with Pulled BBQ Chicken, Baby Peppers, and Bacon! This is a sponsored post for Farm Rich Smokehouse. All opinions are my own. Thanks to all the companies, and readers, who help support Cravings of a Lunatic. This recipe makes me happy. It’s all of my favourite things combined for one delicious recipe. I’m a sucker for pulled chicken so of course I love pulled chicken pizza. It’s just so full of bold flavours, and the sweet heat just makes your taste buds happy. We all know happy taste buds are the everything in this life. Farm Rich Smokehouse is hosting a Summer BBQ Send Off Campaign. You can enter your own BBQ hack and/or recipe featuring any Farm Rich Smokehouse product on social media between May 30th and Sept. 5th using #99DaysofBBQ . Ten lucky winners will receive a year’s worth of BBQ and a BBQ Party Pack. You can locate Farm Rich Smokehouse products at your local grocery store. Just use their handy product finder to find any of their products: Pulled Pork BBQ, Pulled Beef Brisket, Pulled Chicken BBQ, Dry Rubbed Smoked Pork, Dry Rubbed Smoked Chicken, Mustard Pork BBQ. We bought ours at Meijer Supermarket. I recommend signing up for their Farm Rich Loyalty Club, you can download coupons which is always a great thing. Saving money rocks. It means you can buy more and throw a fabulous grilling party for all your family and friends. Play some games, relax by the pool, whatever gives you joy. Do that. My regular readers know I get joy from grilling. I absolutely adore manning the grill. It’s my happy place. In fact, I even have a grilling blog. It was on hiatus for awhile but it’s relaunching this week. So if you love grilling be sure to head over and check out Kiss My Smoke. There’s tons of great recipes to check out. All family approved. Speaking of family my son is visiting right now. I arranged for him to come down to surprise my husband for his 50th birthday. We snuck him in the house, along with a 55 inch 4K TV, while hubs was out and about. Then my son jumped out from behind a cabinet while I took video. It was beyond hilarious, and worth all the planning. He had the pleasure of enjoying this recipe while he was visiting. Both my son and husband went crazy for this pizza. We make pizza often in our house. 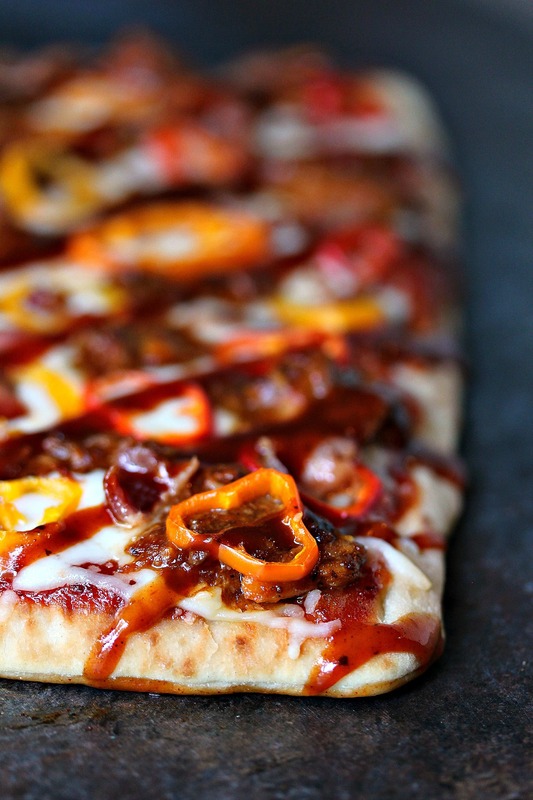 Pulled chicken and pulled pork pizza always goes over well with everyone. It’s so much fun to pile on the toppings and make a killer pizza for the family. I highly encourage you to whip up this recipe. It’s perfect for grilling season, and beyond. You can make this year round if you like. I used pre-made pizza crust. They make flatbread pizza crusts you can pick up at any local grocery store. They cook perfectly on the grill, and you can buy a few to customize for your family. For toppings I used pizza mozzarella because I love the texture of it. Then I used Farm Rich Smokehouse Pulled BBQ Chicken, mini baby peppers, bacon, and barbecue sauce. It’s really that simple. A few minutes on the grill and you have the perfect dinner for yourself, and your family. That’s priceless. 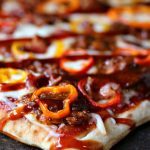 This flatbread pizza is topped with pulled BBQ chicken, sliced baby peppers, and pieces of bacon, then grilled to perfection. Once it comes off the grill drizzle it with more BBQ sauce and dive in! Place pizza crusts on a baking pan to transport the pizza out to the grill, or just arrange the ingredients while the pizza is on the grill. Crust first, then 1/3 cup pizza sauce on each crust, followed by 1 cup of pizza mozzarella on each crust. Heat the pulled bbq chicken in the microwave according to the package directions, mix in 1/4 cup of barbecue sauce, and stir. Drop pulled bbq chicken randomly over each pizza crust. Top with sliced peppers, and chopped bacon. Place on grill and cook for about 5 to 10 minutes, depending on your grill. If you're worried about the bottom cooking too fast you can use indirect heat initially so the cheese melts but the bottom does not burn. Indirect heat is your best friend during grilling season. Remove from grill and slice. Pin this to your favourite Pizza Pinterest Board! Take some time to peruse my recipe index. You can find lots of pizza recipes plus tons of dinner recipes. You can also take a gander at my grilling recipes. This is creative! Beautiful photography, as well! Sounds like a great new way to enjoy pizza! Thank you for sharing at Merry Monday! Gorgeous photos, and now I’m hungry!! These pictures make me DROOL! Just gorgeous! I love these flavors too, I can’t wait to try this! This looks all kinds of delicious! I’m a huge fan of sweet bell peppers and easy dinners and this looks like a winner! This sounds like such an awesome convenience product, and that flatbread is making my mouth water. Oh I haven’t seen that product yet. I love using pre-made items to make quick pizzas on busy nights. This sounds so delish! Grilling pizza is our favorite! I can’t wait to try this flavor combo- it looks AH-mazing! You can never go wrong with serving pizza, but sometimes it gets boring. I love how you’ve shaken things up with the peppers and BBQ sauce. Looks delicious! That is one gorgeous pizza! I love pulled chicken too! It’s the best. What a great easy dinner idea. This recipe makes me happy, too! I always just make boring old pepperoni pizza but now I’m wanting to try something like this. And I need to find that pulled BBQ! So convenient. That is one amazing looking pizza! I’m so full from a big lunch, but these pictures make me HUNGRY!!!! Seriously mouth-watering. So yummy. NEED. my kids love pizza but my husband usually orders pizza from Pizza Hut. now I have a nice suggestion to make my own pizza to give them 🙂 thanks for sharing. Just by the look, I could tell this recipe is tasty. Great job. Incredible photograph. This makes me feel hungry, haha. Thanks for sharing and have a nice weekend.